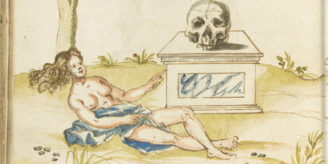 In the first of a new series, Conservator Amy Junker Heslip talks us through the conservation treatment she undertook on some of the Wellcome Library’s alchemical manuscripts. The Ripley Scrolls are manuscripts which illustrate the pursuit of the Philosopher’s Stone. George Ripley was a Augustine Monk from Yorkshire (c.1415-1490) but was additionally renowned as an alchemist. His name is associated with these scrolls as his allegorical poetry is included in many of the versions. There are approximately 21 scrolls worldwide, produced after Ripley’s death, dated from the 16th-17th centuries. The Wellcome Library holds two of these scrolls, MS.692 and MS.693 and they are listed on the library catalogue as being on restricted access due to their fragile nature. They are dated from the 17th century, copy of a 15th century copy, and are water colour, wash and ink on heavy weight handmade wove paper. Both scrolls are mounted on linen and are stored rolled with wooden rollers at each ends, housed in wooden boxes. They are long with dimensions of 3280 x 400 mm. On closer inspection I was able to assess the physical condition of both objects. While the condition of MS.693 was stable and only required re housing (a new box), MS.692 was in a far worse state. The upper section had sustained a large amount of water damage, resulting in staining to the primary support and multiple losses to this upper section. The verso of this upper, lifting section had been lined with a heavy weight board in an attempt, one can only assume, to support these losses on the verso. Throughout the scroll, there are lifting areas of the primary support. The bottom of the scroll has been detached from the roller and re attached with tabs of paper. The ink tested positive for iron gall ink and other colours proved very water sensitive upon testing. Although I was reasonably convinced that I could remove the linen backing dry, the relining would involve unnecessary exposure to moisture. The board attached to the upper layer of the reverse of MS.692 was removed manually with a scalpel and immediately relived the tension added by this support so the upper section could lie flat again. The linen revealed below was heavily degraded and so was relined with a very strong but light weight silk crepeline. On the heavily water damaged areas on the front of the object the lifting areas were adhered using cold gelatin, to avoid unnecessary moisture contact with the iron gall ink, and in filled with a similar toned Japanese paper. The bottom roller of MS.692 was re-adhered more securely, with an extension of a medium weight repair paper added so the scroll could be comfortably opened up to its fullest extent. Both items have now been rehoused into custom made boxes and are now stable. While they are both accessible again to Wellcome Library readers, it has been decided that their restricted status will be retained (due to the oversize nature of the material), so they can be viewed in an appropriate environment.